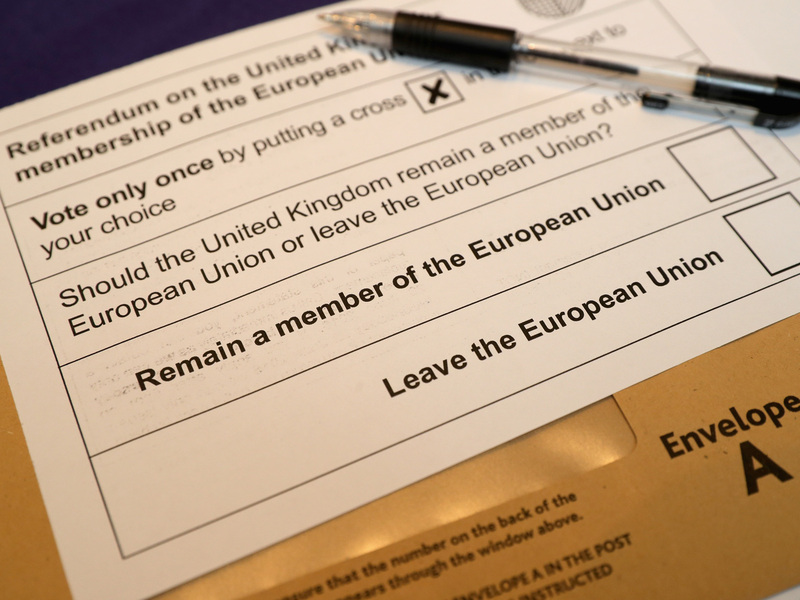 A Guide To Britain's 'Brexit' Vote : Parallels British voters on June 23 will cast what some have called the most important vote of their lives — on whether the U.K. should remain in the European Union. Here's a guide to the main issues at stake. Voters will decide on the "Brexit" question in a June 23 referendum. Postal voting forms are available ahead of time. British voters on June 23 will cast what some have called the most important ballot of their lives — whether the U.K. should remain in the European Union or pull out, in what's become popularly known as a "Brexit." There's been a blizzard of claims from both supporters and opponents of exiting the union, and while most polls show a neck-and-neck race at the moment, the number of undecided voters is high. Just a week before the vote, campaigning was brought to an abrupt halt Thursday by the murder of Jo Cox, a member of parliament for the Labour Party. She favored remaining in the EU. She was shot and stabbed in a West Yorkshire village after meeting with constituents. Police have a 52-year-old man in custody and are investigating his mental health and possible links to far right groups. Here are answers to some of the key questions surrounding the Brexit vote. The ballot question is short and direct: "Should the United Kingdom remain a member of the European Union or leave the European Union?" The two camps are officially known as "Remain" and "Leave," though various other monikers have been attached to the campaigns. Having tried and failed twice during the 1960s to join the EU's precursor, the European Economic Community (France vetoed the U.K.'s bid in 1963 and 1967), Britain finally joined the EEC in January 1973, along with Ireland and Denmark. The European Community, as its name was shortened to, was absorbed into the European Union in 2009. From the outset, the U.K. was a skeptical member. Lately, opposition to the union has grown. The issue has split Britain's top politicians, especially within the ruling Conservative Party. Prime Minister David Cameron is in the Remain camp, while former London Mayor Boris Johnson, the politician seen as his likely successor as Conservative Party leader, favors the Leave camp. Labour Party leader Jeremy Corbyn recently came out strongly in favor of staying in the union. Among voting-age Britons, polls show that older, white voters are more likely to vote for a Brexit, while younger people want to stay in the EU. History also shows that older voters are more likely to actually turn out and cast their ballots. What are the big issues in the campaign? For "Brexiteers," as the British media have taken to calling them, concern over immigration tops the list. There is some overlap with the right-wing, anti-Muslim sentiment that has grown in Europe, as Syrians, Iraqis, Afghans and North Africans fleeing conflict and seeking greater opportunities have moved in large numbers toward the continent. One of the Leave campaign's arguments has been that staying in the EU could mean an invasion of Turks. But stopping migration within the EU is a primary motivation for many Leave supporters. A common rallying cry at pro-Brexit events is the need to "regain control of our borders," an issue that resonates broadly. The most recent figures put net migration to the U.K. at 333,000 in 2015, the second highest total on record. Net EU migrants accounted for 184,000, more than half that total. That's put down to the relative strength of the British economy and one of the pillars of the EU Treaty of Lisbon, free movement within the union. The Leave campaign says the only way to get the overall number down to the 100,000 a year Cameron has promised is to pull out of the EU. Cameron and other Remain supporters argue there are better ways to control immigration than a Brexit. Cameron says exiting the EU would amount to "trashing the economy," and various economists and business leaders have come forward with warnings about job cuts in the hundreds of thousands and lost income amounting to thousands of pounds per household. The Leave camp says those figures amount to scaremongering, based on dubious assumptions. Leavers argue that it would be relatively easy to renegotiate favorable trade deals with the EU, while Remainers say those negotiations could be extremely difficult (see below). Whether or not voters accept the sometimes contradictory economic scenarios being presented by the two camps, the general fear of a post-Brexit economic slump could prove persuasive to undecided voters. Is this month's vote decisive? Absolutely not. It would almost certainly force Cameron to notify the EU of Britain's intention to exit, which would trigger Article 50 of the Lisbon Treaty, which governs the right to leave the EU. That would start a two-year negotiating process to hammer out details of the exit. Here's one scenario accepted by many in the Remain camp: If the U.K. votes to exit, the negotiators on the EU side would have an overwhelming desire to prevent other disgruntled member states from following suit and starting a stampede for the exit. Therefore, the argument goes, they would offer the U.K. very poor exit terms — such as drastically limiting the U.K.'s access to the EU single market — as a warning to other states. At that point, there would be nothing to stop the U.K. from holding another referendum. Brexiteers argue that's an unnecessarily gloomy scenario, and Britain could easily join other non-EU countries that have economic agreements, such as Norway. Are there any other potential ramifications of a Brexit? Yes. You need only to look north, to Scotland, to see one possible bit of fallout: In 2014, Scots defeated an independence referendum, with many "No" voters citing the benefits of being in the EU as the reason. Advocates of an independent Scotland say a Brexit vote would very likely trigger another independence vote in Scotland within two years. What Effect Might the Killing of Jo Cox Have? Thursday's murder of Cox, a widely respected, even beloved junior lawmaker from Yorkshire, is a wild card for the referendum. Some wonder if voters still on the fence might be moved to cast a sympathy vote to Remain in the EU as a show of solidarity with Cox, who campaigned for the U.K. to stay in. On the other hand, the hiatus in campaigning caused by her death came at a crucial moment, with the Leave campaign gaining ground, even pulling ahead in some polls. It's not clear what impact the interruption in campaigning might have on either side, or on the undecided voters.